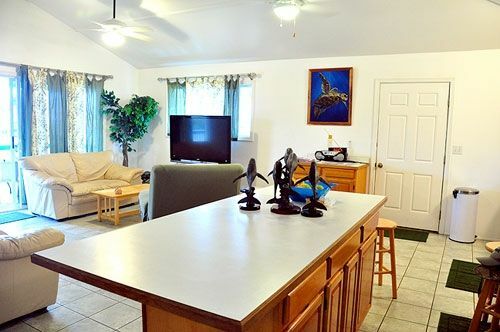 This vacation home is unique in that it is so very centrally located in downtown Kapaa. The house was built in 2001. It has 3 bedroom, 2 bath, 2200 square foot, two levels. It is only a minute walk to the Beach. It has ocean and stream views. Sleeps 6 people. This Vacation Home is walking distance to downtown kapaa shops, post office, restaurant, banks, and groceries stores. The ocean front walk and bike path starts right out front of the house about a minute walk over the kapaa boat harbor and state park. The house is situated to get the trades wind breeze through the entire house. Baby beach is a favorite with many of my guest and children. WE GURANTEE YOU THE LOWEST PRICE FOR ANY COMPARIBLE HOME THIS CLOSE TO THE BEACH ANYWHERE ON KAUAI OR THIS AREA. if you want quite and away from all the action then this home is probabley not for you. It is located right in historic kapaa of kuhio hwy. You have the ocean in the front of you with the kapaa boat ramp for the fishermen and whale watching. Then you have kuhio hwy one lot away from your home which is the main hwy on the island. if you want to get away from any noise then look top get a place up in the mountains. Bedroom #1 is downstairs and has a king-size bed with pillow top mattress and beautiful dresser. It comes with Double Glass sliding doors and Double Mirror sliding doors. and double Glass sliding doors that lock and open up to the gate that leads you right to the beach. Upstairs is bedroom #3 which also has a king size pillow top mattress bed. All my renters love the beds and say they are the very best and most comfortable of any Vacation House they have ever stayed at. Downstairs also has a full bathroom with a tub and a washer and dryer room with free surfboards to use while staying at the house. There is a nice yard right out the bottom door of the house for relaxing and playing with the kids. garbage disposal and stocked with all your cooking utilities, plates, cups, silverware and knives for cooking and eating. The house has a High Beam Ceiling that gives you great space. (No crowded condo or hotel living feeling here). There is an outside table with chairs on the deck where most people sit and watch the ocean view while they talk and relax or eat and just enjoy Kauai. You park right next to the house. No long walking to get to YOUR HOME. Great cell phone reception all over the area. This is your home away from home. THIS IS THE BEST FOR THOSE WHO WANT THE BEST. WE GURANTEE YOU THE LOWEST PRICE FOR ANY COMPARIBLE HOME THIS CLOSE TO THE BEACH ANYWHERE ON KAUAI OR THIS AREA. Good snorkeling is available. There are several surfboards available for free for use for all guest.. The new ocean front walk and bike path is also lots of fun and right next to the ocean. Baby beach is also very popular and walking distance from your house. Your front yard is the Lihi State Park with the only small boat ramp in Kapaa, the largest city on Kauai. You can get fresh fish right there that you can grill on your out side grill. Why stay in a condo and have to walk a long way to your room when you can have this house with parking right next to your home? A new fence with a locking gate now provided more privacy. After living and surfing on Kauai for over 40 years, I can tell you that it is great to be in the center of the Island with easy access to all area of the Island of Kauai. If you are tired of long walks to your room after you park your car at the hotel or condo, and have to pay sometimes $20.00 per day parking, then come stay with us. then come stay with us in your own single family home. You will have a great time at this Vacation Beach House in Kapaa. If you want to have a SAFE surfing vacation then I can help you with my wave knowledge and experience since 1970 on Kauai and all the Hawaiian Islands. This location is the best central area for Kauai. You can drive north, or south and west on any day if you want to. The area in the front of the house offers several activities that you can just walk to. Baby beach, fishing, ocean front walk and bike path, bike rentals surfing, kite boarding, stand up paddle boarding, un-crowded swimming beaches. You can also walk to 10 different restaurants, shops, post office, two groceries stories, business center, and of course Historic Kapaa Town. surfboards and body boards available to use for free, out side hot water shower. Kapaa boat harbour is only a short stroll away with fresh fish and deep water fishing tours available. Size wise the home was great, beach towels and boards provided. It does need some updates and repair ( basement bathroom door) as well as more dishes /cutlery in the kitchen. We enjoyed our short stay in Kapaa. Good location for a short trip and would be great for student groups. Our stay here was great. We had 7 in our group and the house it us fine. Like most people on vacation we spent our days away doing things all over the island and the central location in Kapaa was perfect if you wanted to explore either north or south on the island. I would recommend this place to anyone wanting a relaxing retreat back to a home at the end of a day of exploring the island. No response when we had requests. Last day they walked in without knocking. The place was dirty. No fire alarms, paper towels, very limited toilet paper. Cooked food left in microwave. Limited kitchen utensils. Nothing to clean BBQ. Garbage left from previous people. Beach view was of the parking lot for beach access with construction on-going. 2 beach towels provided for a place that accommodates 8 people. Access to property was limited at times. This property was very disappointing! It was awesome. So close to the beach and right in town. Easy landmarks to find. Used the outdoor shower a lot. We have stayed in this home before and find it just right! !